Mouse anti Bovine GM-CSF antibody, clone CC305 recognizes bovine granulocyte macrophage colony-stimulating factor (GM-CSF) also known as CSF-2. 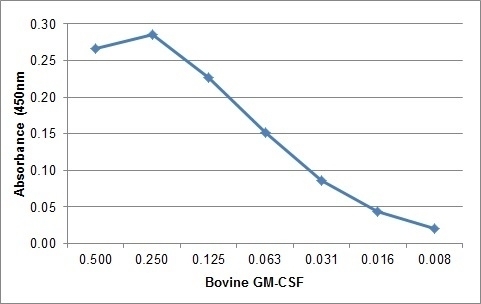 Bovine GM-CSF is a 143 amino acid cytokine which stimulates proliferation and differentiation of hematopoietic precursors. Mouse anti Bovine GM-CSF antibody, clone CC305 has been used as a capture antibody in conjunction with Mouse anti Sheep GM-CSF, clone 3C2 as a detection reagent in a sandwich ELISA for the measurement of bovine GM-CSF produced by peripheral blood mononuclear cells in vitro (Kennedy et al. 2002). Spleen cells from immunised C57/BL mice were fused with cells of the mouse SP2/0 myeloma cell line. This product may be used as a capture antibody in a sandwich ELISA together with MCA1924 when conjugated to biotin as the detection reagent. Kennedy HE et al. (2002) Modulation of immune responses to Mycobacterium bovis in cattle depleted of WC1(+) gamma delta T cells. Boutet, P. et al. (2004) Delayed neutrophil apoptosis in bovine subclinical mastitis. J Dairy Sci. 87 (12): 4104-14. Bao, Z.J. et al. (2014) Recombinant bovine interferon-τ enhances in vitro development of bovine embryos by upregulating expression of connexin 43 and E-cadherin. J Dairy Sci. 97 (11): 6917-25. Vet Immunol Immunopathol. 88: 111-22. Davies, C.J. et al. (2004) Methods of minimizing immunological rejection of a nuclear transfer fetus.